Benzie County is the birthplace of salmon fishing. I get calls from novices who want to learn how to fish, as well as, highly experienced anglers and everything in between. New sports fishing events will add to the array of fishing opportunities in Benzie County, Michigan in Spring and Summer 2015. Competitive fishing tournaments in Benzie County include the “Bag-A-Brown Contest”, the "Battle of the Betsie Fishing Tournament", "Uncle Sam’s Shoot Out" on July 4th, the "Betsie Fishing Frenzy", and the "Honor Coho Salmon Festival". If you love to be out on the water, than Benzie County, Michigan is a perfect destination for visiting this coming season. With nearly 30 miles of Sleeping Bear Dunes National Lakeshore along Lake Michigan, over 50 inland lakes and two rivers, the Betsie and the Platte, there are a variety of fishing opportunities. Even Field and Stream’s Kirk Deeter in 2009 named Michigan the number one fly fishing state in the nation. Benzie County is known for its year-round fishing for rainbow, brook, brown, and lake trout, small mouth bass, northern pike, yellow perch, blue gills, whitefish, rock bass, and sturgeons on the rivers and lakes. 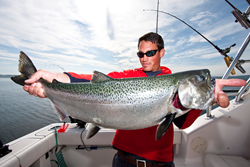 King salmon, coho salmon and steelhead are popular fish caught on Lake Michigan along the coast of Benzie County. Wolfe Outfitters runs guided fly-fishing and light tackle trips from his service Wolfe Outfitters, a full service fly-fishing outfit based at Crystal Mountain in Benzie County. “Quite a few customers, who have never fished before and who want to experience all that Northern Michigan has to offer, call me," Wolfe says. “I get calls from novices who want to learn how to fish, as well as, highly experienced anglers and everything in between.” Wolfe Outfitters caters to novice, intermediate and experienced anglers, both children and adults, and includes the tackle and equipment, and boats needed. Wolfe works with his guests to customize their experiences. He listens to their interests and then makes all of the arrangements to help make their dreams come true. Wolfe adds, “Benzie County is the birthplace of salmon fishing. Whatever Michigan has now was started in Benzie County. What so many people do for enjoyment all began here. It’s great to fish in that same body of water that made history for so many anglers. The Platte River State Hatchery is where salmon fishing on the Great Lakes began and that history is still happening as this hatchery is still a main egg harvesting station for Coho salmon in the upper Great Lakes. Wolfe also offers Eco – Cruise Tours on Benzie County rivers offering sightseeing and close up views of the area’s natural habitat. Charter Fishing is also a popular sport in Benzie County in spring, summer and fall. Fish often caught on Frankfort charter fishing excursions on Lake Michigan include: Steelhead, Coho Salmon, King Salmon, Brown Trout, and Lake Trout ranging in size from 8 to 30 pounds. There are a number of charter fishing captains located in Frankfort, Michigan, along the beautiful Lake Michigan Coast. Frankfort is an important port city in Michigan offering one of the deepest harbors around, great for fishing the bigger fish. The charter captains and their crew make these excursions eventful by serving their guests with fishing skills and knowledge: setting the hooks, helping to reel-in the fish once they’re on the line, knowledge about where the best fish can be caught, and cleaning the fish when the excursion is over. The luxury of a charter excursion includes an onboard bathroom and all of the equipment for the charter fishing experience, as well as other amenities per boat. Frankfort has an ideal port that allows big charter boats, those ranging from 31 to 38 feet and weighing up to 22,000 pounds, to operate out of the channel. Other towns to the north are not as well suited for these bigger boats due to access and water depth. The advantage of bigger boats is that they are more stable in the water and can support twin diesel engines for power and safety. Trolling along Frankfort’s “first bank” in a big charter boat in net-free waters makes “big fish” fishing a pleasurable and safe experience for novices and experts alike. The fishing charters in Frankfort specialize in families and groups who are not that familiar with the sport, as well as more avid fishermen. Fishing outlets in Benzie County for equipment, bait and tackle include Backcast Fly Shop located on U.S. 31 in Benzonia (231) 882-5222 and Tag Limit Outdoors located at 9899 Honor Hwy in Honor and Big Bob’s Up North Outfitters in Frankfort. Big Bob’s sells all kinds of equipment from poles to bait to lures in the store and is worth a visit just to see the many different and unique taxidermy - fish and different hunted animals - on the store walls. Frankfort’s Port City Smokehouse offers smoking of fish caught by fishermen and women for those who enjoy this delicacy. Port City Smoke House will UPS the smoked catch back home or to friends. They pack the fish on dry ice and wrap them well for shipping. With over $25,000 in cash and prizes, this fishing contest at Mineral Springs Park is open to anyone. There are three Divisions with a Ladies Classic on Friday and Big Fish Only, Amateur Division, and Pro Division on Saturday. For more information see http://www.Frankfort-elberta.com or http://www.tournamenttrail.net or call 231-352-7251. The 49th annual Coho Festival, one of the most unique Michigan fishing events is a three-day event centralized in Honor, Michigan. The festival, which began in 1967, celebrates the 'salmon run' up the Benzie County Rivers. Benzie County's Platte River was the first river for salmon planting in Michigan. Festivities include family activities, children’s games, smoke fish contest, horseshoes & softball tournament, car show, parade, Upstream 5K, live entertainment, fireworks, and more. For more information see visitbenzie.com or call 800-882-5801 for more information. For a complete lodging listing see http://www.visitbenzie.com . For more information about marinas, gear, bait and tackle locations in Benzie Country see http://www.visitbenzie.com under “things to do” - fishing. Benzie County has the reputation as “the best place in Michigan for Outdoor Sports & Recreation” and is located 30 minutes west of Traverse City, Michigan with two convenient airports available nearby. Benzie County is comprised of quaint vacation towns and villages such as Frankfort, Elberta, Honor, Thompsonville, Beulah, Benzonia and Lake Ann. In the center of the county is the majestic Crystal Lake and there are over 50 other smaller lakes and two rivers throughout Benzie County. Lake Michigan stretches along the entire West boundary of Benzie County and includes nearly 30 miles of Lake Michigan Shoreline along The Sleeping Bear Dunes National Lakeshore. Benzie County is a perfect destination for a relaxed getaway with pristine beaches, miles of biking and walking paths, majestic views of Lake Michigan, and plenty of great restaurants and shops as well as scenic and family attractions. There are also Champion quality golf courses, 22 miles for biking along the Betsie Valley Trail, and approximately 200 miles of rivers. Outdoor activities in the spring, summer and fall that are popular in Benzie County include trolling, casting and fly fishing, charter fishing, golfing, biking, tubing, hiking, canoeing and kayaking, paddle boarding and surfing.